ing, "No man lives alone,"
Spa Hotel, Gulf stream Room. standing humanitarian support of the State of Israel. are invited to attend the Pacesetter luncheon. 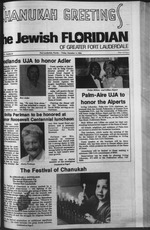 minimum 1986 UJA commitment of $600. which starts the night of Dec. 18. David Kaminsky of Lauderhill presented a proclamation naming Nov.
sonally selected. Melanie is Morris' penpal. dominant culture which appeared to be all-pervasive. Florida and the New York Metropolitan area And as always, our services are r"
Cor, ami Charlotte Padek, Education Conclave chairman. with the majority of the functions yet to happen. Auditorium. Guest speaker will be Dr. Ron Kronish. Isaac Horowitz and Reba Goldstein as co-chairmen. chairmen Matt Dinah and Nat Ginsberg. will hold a cocktail party on behalf of UJA at 4 pjn. Chanukah gifts shipped by JWB. the Division on behalf of UJA. ft!1? &lf course- The extras, the nice. ping our residents" feelings of security. managed by Retirement Centers of America. ^charms, the concierge. Dry cleaning. serve by your schedule, not ours. munity is the feeling of security. At Westbrooke. to your call will always be made. three hours' drive from Vienna. the president of Austria, Dr.
from a book, "Die Mazzesingel,"
they must speak for thamaaJvew." visited it in a two-week period. presented mainly in Gorman by' classic Yiddish fib! from the Hebrew Uni- land and the U.S.
Affairs of London; end YIVO. This, he said, was the! the past will not be forgot! resolve conflicts at all levels. on Sunday evening, Feb. 10.
and Mrs. Sheldon Polish and Mr.
Bush st the White House. French lives in recent months. why I should doubt his words,"
Mrs. Alan Becker, Mr. and Mrs.
George Berman, Mr. and Mrs.
Mrs. Alan Levy, Mr. and Mrs.
Stuart Levin, Mr. and Mrs.
Martin Lipnack, Mr. and Mrs.
Arnold Mann, Mr. and Mrs.
Mildred Padow, Mr. and Mrs.
Sheldon Polish, Mr. and Mrs.
Joel Reinstoin, Dr. and Mrs.
Marc Schwartz, Dr. and Mrs.
Robert Segaul, Mr. and Mrs.
Barry Simner, Mr. and Mrs.
Theodore Sobo, Mr. and Mrs.
women. The instructor will be Dr.
anywhere else. And they're certified Kosher! both Egypt and Israel," Mrs.
3- Who was known as "Mr.
the City of New York? 4- What is a Get? But There's Still Time to Win! Publix Bakeries opan al 8:00 A.M.
tray for year ckristaaa party or special meal. Ash yowT bahery salesperson for details "
Dec. 13th thru 19th. 1984.
la is moving right along. heritage of song and dance. for group, of 10 adult, or more. flights to over 100 cities every day of the Hanukkah season. December 13,1984, at either 10:00 am or 2:00 pm. Drive North, Pom pa no Beach. attached coupon or calling (305) 975-8900.
slightly shrunk from side of pan. warm. Yields 18 to 24 bare. traditional, one in the United States, and one in Israel. and salt, and bring to a full boil. casserole. Add water to cover. for an additional Sd minutes. Keep warm and serve hot. but kindled from left to right. people in many ages end still shines brightly today. ages past at this time of the year. You are to be praised. Lord our God, Ruling. commandment of Moses, our teacher. I rfl give you two. Om is the people, Iarsst. Two are the Shebbat candles. One is the people. Israel. Who will give me four? I will give yon four. Four are the corners of the Talit. Three are the sections of the Bible. Two axe the Shebbat candles. One is the people, Israel. 2 Potato----------------------ares favorite Chanukah food. 1 On Chanukah we spin a---------------------. 5 We put the candles in a------------------------. 8 A hero of Chanukah is------------- . &*"" ** Sprinas, Arkansas. 3500 years ago. -"> rising in the Mountain Veley spring today. "** touched by man-made pdbtton. stand for the Hebrew phrase "A great miracle happened here." Each letter is given a special value, such as "take all," "toes all,"
then does whatever the letter stands for that the dreidel falls on. Then dreidel 1 shall play.
. 20, at 8 p.m.
menorah which has sight candles. tions, whose director is Prof.
Israel Tower of David Award. Couvert is $6 per person. (AIPAO at a recent AIPAC meeting heldinpCS? effects of the recent presidential election. Tickets are on sale . our wines and champagnes are !r':c ;"
beans, meat, peas and eggs. 8- It is our only Testament. t to me a private doctor. catching up on the latest news of their brood. Or herd, as the case may be. this country, nor of The Shetlands, have ever been sheepish. AIR, well gladly check your tires ? _. Weat UJA: 7 pjn. Hat iky ah Chapter: Noon. ter: 11:30 a.m. HMO luncheon. Club: Picnic at Tree Top Park. 2:30 p.m. Review of "The Haj,"
CHy of Tamarac UJA: 7:30 p.m.
Jewish Center, 9101 NW 57 St.
Chib. Guest speaker Gert Aron. Hebrew Culture Club: 1 p.m.
program. Joe Goldhar will speak. Building 47 Room 112. 722-4916. IC. P. CHAMBERS, performing the Istset medlcsl f<*nkru#^on. gtry without discomfort, without bandages. Itormore information and a no-cost consultation. Office Hours Mon.-Frl. 9-5 .
good Santa should take advantage of it. know where else to go. As our session continued, Mr.
the best alternative was to leave. direct result of low self esteem. ship and make positive changes. in honor of their B'nai Mitzvah. Have fun staying fit with tennis | r *>>. count Oct. 8 to Dec. 21. Rabbi E merttua. Dr. Solomon Oold. Cantor Irving Oroaiman. TEMPLE BETH ISRAEL (743-40*0). 7100 W. Oakland Park B!4. 6 p.m., I p.m.; Saturday 8:48 a.m.; Sunday 8 a.m. 8:80 p.m. RakMr*"
Labewi ti. Castor Maurice Nam. TEMPLE BETH ISRAEL OF DEERFIELD BEACH (4H-70B). lighting time RabM Joseph Lananer, Canter ShaMal Acktrma*. SSOSO. Services: Friday 8 p. m RabM Atorrts A. Stop. TEMPLE SHA'ARAY TZEDEK (T41-0SW). 408* Plnit Uland Rl. Samuel April. Canter Samuel eater. M* finer. Castor Met Cehen. p.m.; Saturdays 4Ba.m RabM lirael Haleern. Tamarac, Friday at 8p.m., Saturday 8a.m. Chertae E FyNr. Friday 8a.m.. 6p.m., Saturday 6:46 a.m., 6p.m. service*; Women, Twetdey* 6 p.m. RabM Arse) Llebsrmas. YOUNG ISRAEL OF DEERFIELD BEACH (481-1887) lf"
(BOS-TOT), 8361 Stirling Rd, Fort Lauderdale 8881J Ss"
8 a m (undown RabM Edward Davi*. Service*: Friday 8 IB p.m.. Saturday. 10 am BabMBIH* *"""
Service*: Friday 8 p.m.; Saturday 10 a.m. BebM JsrreH M W"
PMaterten. Service*: Friday 8:18 p.m.; Bekire^y, enoj"
aSne,iT^byDaV4 "> Garvey. 1984. $49.50. - ntCS'Hply fr ,t8 which th* uthor was curator. history as well ss art history. Changes in Our Lives Today. For all the "Trivial Pursuit"
those with just a basic education. At Tamarac Branch. 8601 W.
Vatican at 7 p.m. Thursday Dec.
Dance Dimensions at 7 p.m.
Workshop will dance to "Hymn"
E. Sunrise Blvd., Ft. Lauderdale. be held from 9 a.m. to 4 p.m.
International Bond tribute to Dr. Scheduled transportation and private hmo service by appointment. Free cleaning and housekeeping. Lakefront balcony views.
. Recreational and social programs. 24-hour medical security. Pool, sauna, fitness Spa. Manv other support services and safety precautions. Share the spirit. Share the refreshment.